👉 Get Fit & Lose Weight… Our classes are designed so you always have a full body workout and stay healthy! 👉 Self Defence… We train a highly effective & purposeful Martial Art, all you’ll ever need. 👉 Confidence, Stress Loss & Feeling Good… Build your confidence and have a good time meeting new people & our team. 👉 Free Tasters… When you come to our classes we will spend time learning your needs and making sure we look after you the best we can. Our Martial Arts South East Schools have a great community and culture of students who all support each other, work together and have a good time gaining the benefits from our classes. The most successful way to lose weight and keep it off is to do regular and continued exercise, as well as of course having a healthy, balanced diet. What’s great about training in our classes is that motivation to maintain exercise is effortless. Before class you will be looking forward to developing your Martial Art skills, as well as seeing your friends, and making new ones. This makes it an easy discipline to keep your exercise regular, as you are thoughtlessly self motivated. This is where the Martial Art industry differs from novelty, fad exercise regimes that only last a short while. The pursuit of knowledge, and development of technique will make the momentum of discipline easy for you, so you have an on going and successful training schedule. 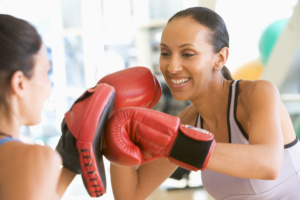 Within class time you will improve your cardiovascular, tone up, and have a good de stress workout on the pads, all made into fun drills and exercises. Our Self Defence system is highly practical and gives you immediate results. Even after your first class you will be safer in a situation. It is our goal and duty to make sure every one of our ladies can look after themselves. Our Martial Art is not a sport, so in the school there is no point scoring or a ring, and due to it’s effective techniques there is no competing. You will never leave our schools with a medal or a trophy, instead you will leave with the knowledge and confidence that you can protect yourself if needed to. Something we pride ourselves on is making sure all our schools have a great culture, community and family spirit, so you will be training in a comfortable and friendly environment. Many women join us to keep their motivation for weight loss and fitness which has faded from the gym. Our classes will make you self motivated as you want to see your friends, learn new skills, so staying in shape is easy. We have empowered women and helped them changes their lives, take control of situations, build more successful relationships, and meet new people and make friends. Forget about novelty workouts and train with us without the long term commitment of the gym. Knowing self defence techniques will not only give you the feeling of safety and assurance, but will also give you the confidence to stand and walk tall – ‘If you look a victim, you’ll be a victim’. Only a small amount of communication involves actual words: 7%, to be precise. In fact, 55% of communication is visual (eye contact, body language) and 38% is vocal (speed, pitch, tone of voice, volume) so you can see how important it is to have confident eye contact, an assertive voice, and an upright posture Training our classes will give you this assurance and composure. This new found self esteem will improve not just your personal safety, but also your relationships at work, at home, and with friends. It is one of the most rewarding things for an Instructor to see his/her students improving and making the better of their lives. We work very closely with our female students to help and make sure they achieve a fresh and positive way of life. Good communication and openness all helps us have a great relationship with all our students, so we can help them with on their journey. We look forward to seeing you in class, at either Bromley, Brighton, Ashford, Horsham, or Tunbridge Wells schools.